The login manager is MDM, known from Linux Mint. In my opinion it’s too heavy for netbooks. In Manjarobox you get Slim, which is much more appropriate. This was the first thing I changed to reflect Manjarobox after I installed the Netbook Edition. 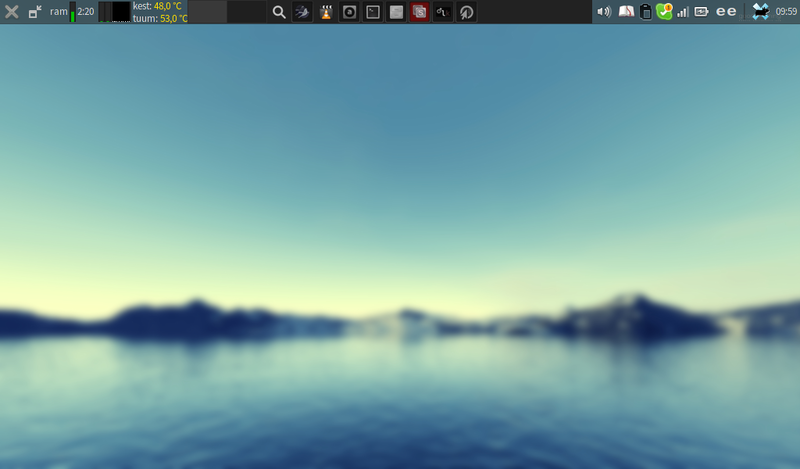 Manjarobox features Openbox, which is a light desktop. Light basically means that there are no desktop icons and the apps menu opens with right-click on the desktop, instead of having a dedicated taskbar button. Still, for example the invaluable systray is there. The most visible departure from the usual Xfce is the central taskbar in Netbook Edition. The central taskbar is replaced with DockbarX. 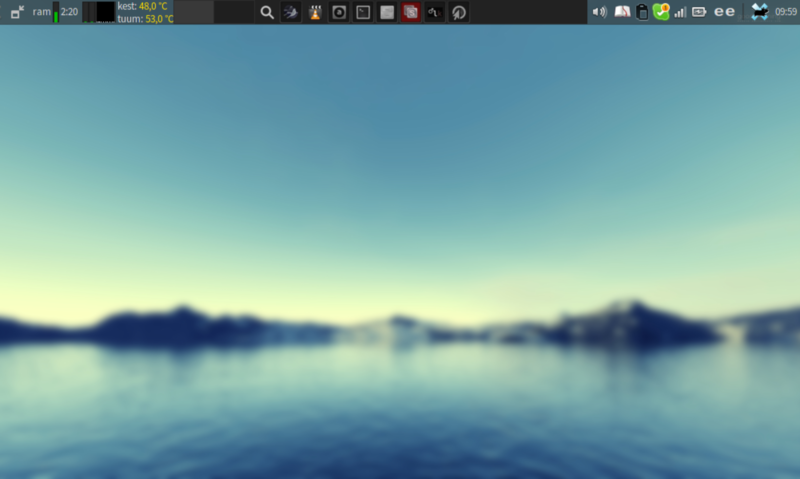 The taskbar in normal Xfce behaves like in XP, whereas DockbarX always iconifies the open apps. When hovering the mouse pointer above the icon in DockbarX, you see the list of open windows with an opportunity to switch to them or close them with precision. Right-click on the icon provides you with some actions, such as pin, (un)maximise, and close the application – Win 7 style. There’s a unique default behaviour configured into Netbook Edition’s desktop environment: Apps start up with maximised window. I was wary of this behaviour at first. This was one of the reasons why I didn’t try Netbook Edition on my netbook sooner. However, now I have seen it in action and it seems that this behaviour makes kind of sense in netbooks. Some oddities occur due to this maximisation behaviour, for example when you copy files in Thunar, a full-screen progress window pops up instead of a small progress bar. Still, by default you have the well-considered unmaximise button on the taskbar. It’s also possible to easily configure a keyboard shortcut to toggle window maximisation in Xfce, so in the end this is not a problem. It’s a feature. Compared to Manjarobox 0.8.8 which was very minimalistic, Netbook Edition comes with more apps, such as Midori browser (versus no browser in Manjarobox 0.8.8), Xfburn (I don’t know why this is here; how many netbooks have a DVDRW drive? ), Audacious, VLC. I liked the lack of apps in Manjarobox better. Manjarobox 0.8.8 even lacked the graphical applications manager (Pamac in Manjaro), so that you had to know the command-line way of adding apps at first. To compensate, Manjarobox comes with some important installation scripts in the apps menu – menu items to install the graphical applications manager, office software, printers’ drivers, multimedia codecs, and more. Manjarobox’s installation scripts is something that is in turn missing in Netbook Edition and this is a serious miss in my opinion, because, for example, even though some multimedia apps are there in Netbook Edition out of the box, not all codecs are there. Xfce goodies, such as the CPU graph and Clipman; this is another miss in the default selection of apps in Netbook Edition in my opinion. To me, these goodies are inseparable from Xfce. In comparison with Manjarobox, the screen lock and suspend at lid-close is configured properly out of the box. This how it should be in any OS version specifically catering to laptops and similar. For this edition, the developers have optimised the kernel (for the i686 architecture version; Netbook Edition with x86_64 architecture doesn’t have this). I am too dumb to understand the benefits of the optimised kernel, but there’s more: Also Flash plugin, which I thought inappropriate for my netbook and I didn’t even try in Manjarobox, is specifically optimised and works like a snap in all browsers! Now, disappointingly again, these optimised packages – linux312-netbook and flashplugin-netbook – don’t seem to be readily available in the repositories. Manjarobox users would really appreciate them. All-in-all, there are some important things in this edition that make it worth trying, such as the optimised Flash plugin and considerately pre-configured lid-close. The misses are minor and easily remedied. If you have a netbook and some experience with Manjaro, give it a try. My netbook has 1 GB RAM and Intel Atom CPU N450 (-HT-) clocked at Min:1000.000Mhz Max:1666.000Mhz. Netbook Edition’s Xfce desktop works here almost as snappy as Openbox that I tried earlier. I was perfectly satisfied with Openbox, but I like some of the added functionality in Netbook Edition, such as the window tiling by dragging, and I have learned to like the auto-maximised windows. With less RAM and weaker CPU however, Openbox would still be a smarter choice considering the resources. Here’s a follow-up to the blog post Create a bootable USB stick in Linux. The first time I reformatted my USB stick from bootable to a normal file-storage device, I followed some other instructions, but now Webupd8.org instructions worked. 1. Insert the USB stick. 3.There will be the description of the activities of the last active device. The device name will be between brackets as [sdd], [sdc] or [sdb]. See what you got and remember it. The sdb bit should be your own device of course. However, sometimes the command doesn’t work. I had to use the graphical file manager to unmount the device. The -F 32 can be omitted, but it ensures the most Windows-friendly format. The ‘Label’ gives the device a name. You can have ‘MyUSB’ or such, if you like. 6. After the last command has done its thing (may take time), remove and reinsert the stick to test the result. Looking around the web for solution, I found that the fault is in the dependency called lirc-utils. Note: These instructions erase the whole stick. The result will be just one bootable OS on the stick. In the next post I will tell how to get the stick back to normal, somewhat. If you have automount enabled, unmount the device. cd to the folder where the iso file is. Xterm is a terminal emulator for Linux that I like a lot. For some reason it’s not the default emulator in any distro that I know of. This post is about how to make Xterm select-and-copy-to-clipboard with mouse. One of the features I like in Xterm is the way copy and paste work there. Namely, it’s not emulating modern word processors in this, where you Ctrl+C (or, more often, Ctrl+Shift+C) to copy and Ctrl+V (Ctrl+Shift+V) to paste. Instead, the mouse works there in peculiar ways that may seem cumbersome at first, but make sense later, after some infotechnological enlightenment. This selects everything from the first selected letter (which was really only to mark the beginning of the selection) to the right-click. In truth, this move both selects and copies, but it’s not obvious that it copies. Terminal emulators distinguish three buffers, two of which are important – at least for my purposes. The two important buffers are Primary and Clipboard. The described move to select text in Xterm also copies it at the same time to the primary buffer. This means it’s possible to paste it (with Ins or Shift+Ins or a keyboard shortcut specific for the program open in the emulator) in Xterm only, not paste it elsewhere in the desktop. To be able to copy from Xterm and paste elsewhere, a tweak is necessary. Note: The tweak will copy to the clipboard buffer, not only to primary. This will make the distinction of primary and clipboard buffers disappear. If you need the distinction, don’t use this tweak. In your home folder, a text file named .Xresources or .Xdefaults probably already exists. If not, create it. Create just one of these, not both. If you created the file by the name .Xdefaults, use that name instead of .Xresources. All this done, the described move to select text with mouse in Xterm should do select-and-copy-to-clipboard so that it can be pasted to any other program on the desktop. Elinks is a console-based webbrowser that allows some interaction with mouse. At first glance it’s impossible to grab text, but this works by point-click-and-drag when holding down Shift key. This post is about a specific mismatch of default settings between Manjaro Openbox desktop and Elinks web browser. For a while I was puzzled why Shift+Left-Click+Drag doesn’t select text in Elinks in Manjaro Openbox desktop, but the answer is stated openly in the default conky script on the desktop: Left-Click+Drag is reserved for moving windows around on the desktop and this conflicts with the function in Elinks despite the distinction of Shift being pressed or not. I decided to change the desktop default. The solution is to find, in Openbox RC (.config/openbox/rc.xml), the guilty section that causes the mouse behaviour and to remove it or comment it out. Since I removed it already months ago, I don’t even remember what the actual section was – and I am happy about this. The result is that Shift+Left-Click+Drag will select text in Elinks again. Also, dragging windows around remains working, only not in the entire window area any more. Now you have to select precisely the upper window bar to Left-Click+Drag windows on the desktop. In summer 2013 I set up Elinks text browser. To me it makes sense as a replacement for Opera browser component, because I use Opera primarily to read and type, not watch images or videos. So, this post is for those who don’t care so much about images and videos on the internet, but care a lot about text and urls. Here are snippets from my elinks.conf file with comments. I mostly show the changes that emulate Opera plus some inevitable differences from Opera. When you open up Elinks the first time, you can open up configuration options by pressing o and keyboard settings by pressing k. After some time and effort in those two dialogs, elinks.conf file becomes understandable and then it’s possible to edit the file directly. At first startup, Elinks opens up the address field, called “go-to dialog”. It’s similar to Opera’s F2 address field. Since I don’t want this dialog at every startup and at every new tab (yep, Elinks does tabs), I have this setting at 0. Otherwise you’d have to press Esc to get rid of it at every startup and every new tab. Those g, h, and s are default shortcuts which can also be changed. bind "edit" "Shift-Insert" = "paste-clipboard" bind "edit" "Tab" = "auto-complete"
Paste-clipboard, obviously, pastes to the address field from clipboard. Rather than Ctrl+v it’s better to have it Shift+Ins because this is the regular shortcut in consoles. Tab completes some typed text on the address field from history and bookmarks. ## document  #  Document options. ## document.colors    #  Default document color settings. ## document.colors.background <color|#rrggbb>     #  Default background color. set document.colors.background = "black"      ## document.colors.use_document_colors <num>     #  Use colors specified in document:     #  0 is use always the default settings     #  1 is use document colors if available, except background     #  2 is use document colors, including background. This can     #    mostly look very impressive, but some sites will appear     #    really ugly. Note, that obviously if the background is     #    not black, it will break the behaviour of transparency. set document.colors.use_document_colors = 0    ## document.css    #  Options concerning how to use CSS for styling documents. ## document.css.enable [0|1]     #  Enable adding of CSS style info to documents. set document.css.enable = 0  bind "main" "B" = "toggle-display-tables"
The toggle to render/ignore tables is the uppercase B. In the keybindings, lowercase and uppercase keys are different bindings. Again, change it to what you like. When you are in the keyboard bindings dialog in elinks, and you try to set a binding that already exists, you get a warning along with the opportunity to overwrite. This makes images show up as [img] if they have no alt text. The [img] is a link that identifies the url when you select it. I have the setting this way just in case the text implies the image may be useful after all, so I can download it when really needed to see. By default, Space moves the page down by a screen. PgUp goes up a screen in the document. To move up and down a row or line, use the default bindings Ins and Del. I saw no reason to change these. If the mouse is enabled, the scroll wheel can also scroll the document by rows, but sorry, no smooth scrolling. bind "main" "Down" = "move-link-down" bind "main" "Right" = "move-link-right-line" bind "main" "Up" = "move-link-up" bind "main" "Left" = "move-link-left-line"  bind "main" "j" = "history-move-forward" bind "main" "u" = "history-move-back"
## document.browse.links      #  Options for handling of links to other documents. ## document.browse.links.numbering [0|1]       #  Display numbers next to the links. set document.browse.links.numbering = 0  bind "main" "/" = "toggle-numbered-links" bind "main" "l" = "link-menu" bind "main" "L" = "goto-url-current-link"
/ will give numbers to all links, so you can type the number to go to the link. When a link is selected, l key (lowercase l) will open up a menu that contains options like Open, Open in new tab, new window, download, and more. Uppercase L will extract the url in the link to the address field (goto-dialog) for full examination and editing. Of course, Elinks has a sensible status bar so that the url of any selected link can be examined immediately, but the screen width is not always enough. bind "main" "Ctrl-D" = "add-bookmark" bind "main" "a" = "add-bookmark-link" bind "main" "Ctrl-S" = "save-url-as"
By default, lowercase t key opens up a new tab, but in a non-obvious way: It duplicates the current page. This is okay so you don’t have to have another keybinding for Duplicate page. You can see that a new tab has been opened because a tab bar appears above the status bar. bind "main" "Ctrl-W" = "tab-close" bind "main" "Shift-Ctrl-Alt-W" = "tab-close-all-but-current"
Some keybindings simply won’t work, I don’t know why. Ctrl+Tab to cycle tabs doesn’t work. The default keybindings to move between tabs are < and >. bind "main" "." = "search-typeahead-text" bind "main" "Ctrl-F" = "search" bind "main" "F3" = "find-next" bind "main" "Shift-F3" = "find-next-back"
With bindings like this, a simple . key will allow search-as-you-type like in Opera. Ctrl+F will open up a search dialog as in most graphical editors. The next item will be highlighted by F3 and the previous by Shift+F3. Links don’t need specific search. Above there was a keybinding “/” to identify all links by number, so you can go to any of them by typing the number. Moving between links is as simple as pressing the arrow keys. ## protocol  #  Protocol specific options. ## protocol.rewrite       ## protocol.rewrite.default_template <str>     #  Default URI template used when the string entered in the goto dialog does     #  not appear to be a URI or a filename (i.e. contains no '. ', ':' or '/'     #  characters), and does not match any defined prefixes. Set the value to ""     #  to disable use of the default template rewrite rule. #       #  %c in the template means the current URL,     #  %s in the template means the whole string from the goto     #     dialog,     #  %0,%1,...,%9 mean the 1st,2nd,...,10th space-delimited part     #     of %s,     #  %% in the template means '%'. set protocol.rewrite.default_template = "https://duckduckgo.com/?t=ouk&q=%s"      ## protocol.rewrite.dumb      #  Dumb prefixes, see enable-dumb description for details. ## protocol.rewrite.dumb.g <str>       #  Replacement URI for this dumbprefix:       #  %c in the string means the current URL       #  %% in the string means '%'       set protocol.rewrite.dumb.g = "!g"        ## protocol.rewrite.dumb.d <str>       set protocol.rewrite.dumb.d = "http://dictionary.reference.com/dic?q=%s&search=search"        ## protocol.rewrite.dumb.imdb <str>       set protocol.rewrite.dumb.imdb = "http://www.imdb.com/find?s=all&q=%s"
Hopefully you see the pattern. I have Duckduckgo set to conduct a search when I type something on the address field (go-to dialog) that isn’t an address. When the typed string on the address field begins with “g ” (g plus space), then it will go to Google results via Duckduckgo. When the typed string on the address field begins with “d “, it will conduct the Dictionary.com search, “imdb ” will search Imdb.com, for just a few examples. You can add and change as you like.